The watch brand Graham-London has announced the release of the special line provided for the management of the Russian football club CSKA. 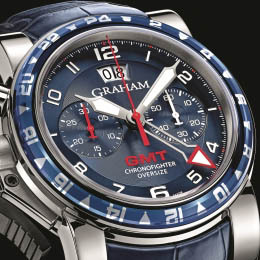 The basic model for a new line is a steel watch from the Chronofighter collection, decorated with red-blue rim. The caliber, on which the novelty is based, is equipped by a chronograph function with two indicators, large date aperture and a second time zone. A transparent sapphire cover and CSKA logo on the dial characterize the novelty. On the back cover is applied the inscription “Чемпионы и обладатели кубка России 2012/13” (Champions and Winners of the Cup of Russia 2012/13). The range also includes signature models. To buy the Graham-London Chronofighter GMT watch can be purchased from the manufacturer for a suggested price of 420 000 rubles.